Among the thousands of people I’ve trained to meditate, I’ve found yoga teachers the most challenging, because, by and large, yoga teachers promote the classic seated posture known as “lotus pose” as the gold standard for sitting in meditation. If you’re not familiar, to sit in lotus pose, you must cross your legs so deeply that the soles of your feet face the sky. I once had a yoga teacher arrive at my studio carrying a yoga bolster, even though I told him in the orientation that we would be sitting comfortably to meditate. When it was time for us to meditate, he instinctively reached for his bolster and positioned it beneath his hips so he could sit as tall as possible in the classical monastic meditation position. Long spine. Chin lifted. Legs crossed. And palms up. The problem was I had just spent an hour reiterating the importance of sitting comfortably in meditation, and how doing so would free his mind to drop more easily into a settled state. He did not look as comfortable on the bolster as he had when he had been sitting on my couch (when we were doing all that talking). When I asked how he felt in his cross-legged position, he explained that the bolster helped align his hip flexors. “On my couch or in bed,” he replied. “Could you show me how you sit?” I asked. He got up off the bolster and sat back on the couch to demonstrate his TV-watching posture. His feet were up on the ottoman as he settled into the back cushion. What so many of us get wrong about meditation is that we have to sit with crossed legs and a perfectly straight back to meditate. It's the classic monastic meditation position, and I'm not saying that it's incorrect for anyone who meditates. Rather, it’s just a tad extreme for all people who spend a lot of time sitting at desks and in cars each day. What so many of us get wrong about meditation is that we have to sit with crossed legs and a perfectly straight back to meditate. To put the two different approaches into context, imagine that you want to start jogging for exercise. If you’re new to jogging and not athletically inclined, your beginner-jogging regimen will be understandably modest—not modeled after an Olympic athlete's regimen. In other words, you don’t need to adopt the training and diet program of a world-class track-and-field athlete in order to jog around the park after work. Similarly, monks are like the Olympic athletes of meditation. What the householder requires from meditation is vastly different from what the monk desires—and the number one requirement for you in the case of meditation is comfort when it comes to your sitting position. If I had to write a dictionary definition for position shaming it would be this: The practice of making yourself or another meditator feel bad for not sitting up completely straight in meditation; meditating in a way that looks good for the camera but feels physically strenuous and uncomfortable. Meditation was never meant to be something that others watched you do. Early on, my meditation teacher taught me that meditation was never meant to be something that others watched you do. Instead of being concerned about what it looks like on the outside while meditating, focus more on what your body feels like on the inside. So, next time you try to meditate—or, even just take a few moments for some deep breaths—try to actually sit comfortably. Sitting comfortably means you ideally want to stay off the ground and sit on your sofa, or in a reading chair, or anywhere else that feels effortless for you. It also means that you want your back supported. 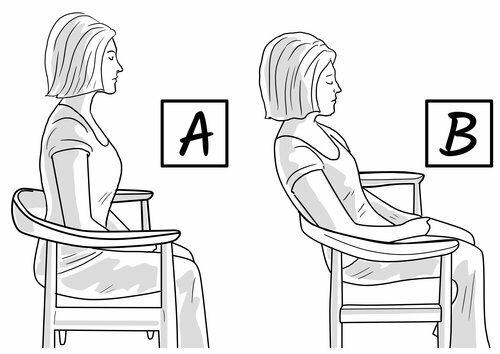 You should still sit relatively upright, but your back does not have to be straight, and your shoulders don’t have to be drawn back. Likewise, your hands and feet can be at ease, and you could even stretch your legs out in front of you if you find that more comfortable. You can use pillows to provide extra comfort to your lower back, or cross your arms while you meditate. And you may wrap your shoulders or legs, or your whole body in a blanket or shawl. Again, we’re going for supreme comfort and coziness here—not Instagram perfection. But as a householder looking to enjoy meditation, you may find that position A works against you, while position B is more conducive to having a deeper, more enjoyable experience. Sitting so straight requires us to exert physical activity in order to hold the body in position. And unnatural physical activity of any kind leads to an increase in mental activity, not the decrease in metal activity that both novice and experienced meditators desire. Unnatural physical activity of any kind leads to an increase in mental activity, not the decrease in metal activity that both novice and experienced meditators desire. In order to have a more satisfying meditation experience, it's highly recommended to sit in a way that reduces unnecessary physical activity. In other words, it's not that you should sit comfortably when meditating. It's that you need to sit comfortably to meditate with success. Remember: Sit like you're binge-watching your favorite show. Light Watkins has been practicing and teaching meditation since 2003. In addition to reaching tens of thousands through his classes—private, public, and online—he writes about meditation for MindBodyGreen. The founder of The Shine Movement, a popular New York and LA live variety show that features meditation, music, film, storytelling, and philanthropy, Watkins leads international meditation retreats, does corporate meditation events, and private courses for high-profile clients.